For the first time since I was a kid, I had some fresh apples. South Texas doesn’t really have apple orchards, and I never bothered to look for them since I’ve moved north. I happened to be at the Union Square green market last weekend and apparently apple season started in July, but it’s new to me! They had several varieties I’d never heard of and samples all over the place. It may be a psychological hippie-green-market thing, or it may just be the different varieties, but I swear these taste a kabillion times better than any super market apple I’ve ever had. My favorites were the purple “winesap” and the “honeycrisp” (Shown below) Just the names are enough! It’s an odd thing to be excited about apples..
Photography-based ramblings: In preparation for Thanksgiving, I added to my photo gear by buying some cheap lighting accessories. For less than $100, I bought a shoot-through-umbrella, light stand, umbrella swivel and a reflector. 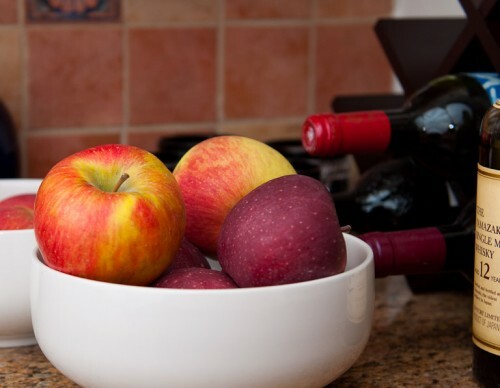 So with lighting gear and a variety of apples, here is the requisite Bowl Of Fruit! I’m just starting with the lighting thing, so I like the soft shadows on everything for now. The way it seems, tastes change the better you get and you start to like harder and harder shadows. Maybe harder shadows are more difficult to do properly and you appreciate the difficulty or something. Who knows, but soft is king for now! The light is pretty flat on this photo. I think I had the umbrella too close to the bowl and I also had the reflector on the right side. I really need to setup the whole tethered-camera thing so I’m not running back and forth to the computer to critique and try again. I have to try a few more things…..
You have the basic lighting idea to get needed detail. For the drama add the shadow with a small focused light. Try two even and make a number of exposures noting distance, light intensity and location.